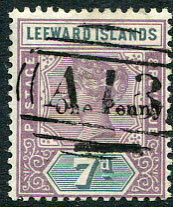 on Leeward Islands "One Penny" on QV 7d (SG.19). 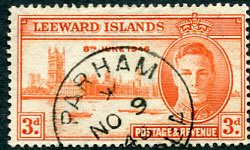 on KGV 2½d (SG.67) piece. 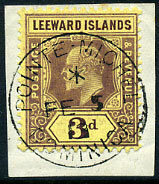 Dated piece with St. Kitts-Nevis KG6 1d and Leeward KG6 1½d tied light St. Kitts A/DE 13 38 cds with oval framed REBUT etc. */MY 7 02 on Leewards QV 1d (SG.2). full strike on QV ½d (SG.1). 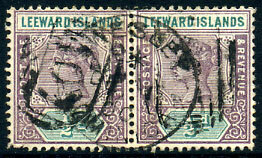 in purple on 2 x KGV ½d (SG.47) piece, some toning. A/JA 3 -- (49, year omitted) on Leeward KG6 2½d RSW (SG.117). 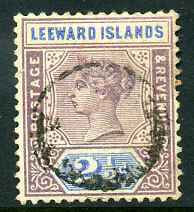 C/JY 25 01 on Leeward QV 1d (SG.2). */NO 9 46 on Leeward KG6 3d Victory. on horiz. 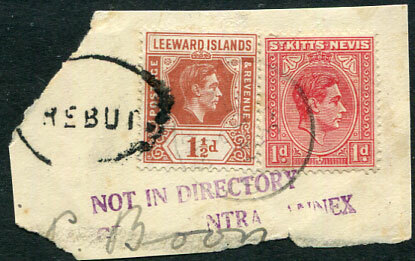 pair Leeward QV 1d (SG.2). Believed to be made with the end of an abony ruler in cases of emergency or on ship mail. 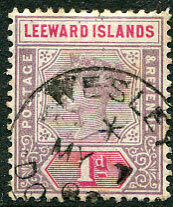 */MR 18 47 on Leeward KG6 3d Victory (SG.116). C/JY 2 01 on Leeward QV ½d (SG.1). 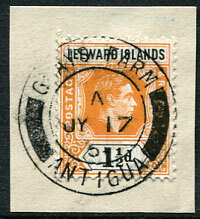 A/JY 17 51 on Leeward KG6 1½d (SG.102) piece. A/23 AP 51 on Leeward KG6 3c University (SG.123). C/DE 11 00 on horiz. 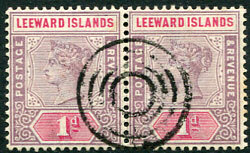 pair Leeward QV ½d (SG.1), minor toning. 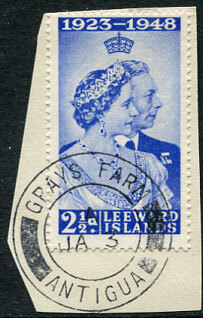 on 1927 KGV 2½d bright blue (SG.67). 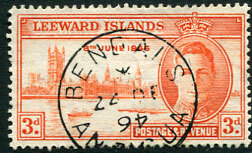 */22 DE 46 (year inverted) on Leeward KG6 3d Victory (SG.115). C/SP 10 09 on Leeward KE7 2½d (SG.40). 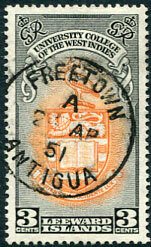 */AU 13 02 on Leeward QV 1d (SG.2), some very light insignificant patchy toning on reverse. 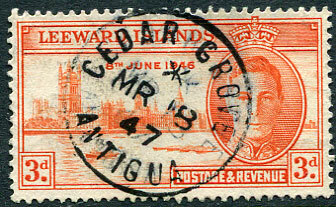 showing "OSA" trace of ROSALIE dated "15" and SOUFRIERE dated */JU 21 without year on 1902 Leewards KE7 1d Crown CA wmk (SG.21). 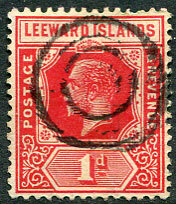 */SP 8 01 on Leewards QV 1d (SG.2). */FE 5 13 on Leeward KE7 3d (SG.41) piece. 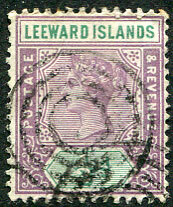 */DE 18 08 on Leeward KE7 2½d Crown CA wmk (SG.23). 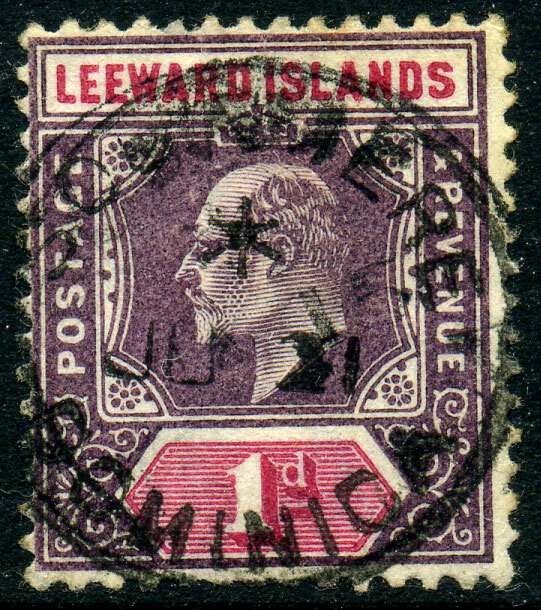 C/SP 3 01 on Leewards QV 1d (SG.2). 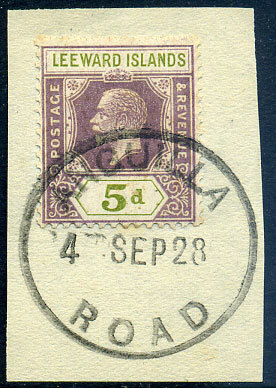 temporary rubber datestamp for 4 SEP 28 on Leewards KGV 5d (SG.71) piece, exceptionally rare on Leeward issues. dated */DE 1 00 and overstruck at Portsmouth with small "A07" on horiz. 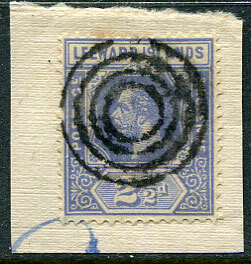 pair Leewards QV ½d (SG.1), rare combination. 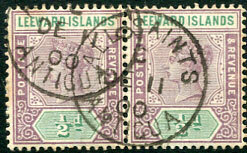 dumb cancel on KE7 ½d (SG.37), toning. full (difficult to determine whether inscribed etc) on QV 2½d (SG.3).